Cool. I'm pretty excited about it, but it's going to take a while to complete. It's definitely the biggest thing I've ever done in MC by at least x4. But it's the gift that will keep on giving, too, so there's that. It's definitely the biggest thing I've ever done in MC by at least x4. Sounds good to me, 709. I think I'm probably the nearest neighbour with my little sub pen in Blackrock Bay, but I dont see any issues. The weird little hut on the hill to the south was made by me and Drew and Rwody while out on an adventure. You're welcome to destroy it. There's a skeleton spawner under the sand to the south-east that I had the idea of making into an arrow/bonemeal farm but I havent ever got round to. If the mood takes you, feel free to take it over. 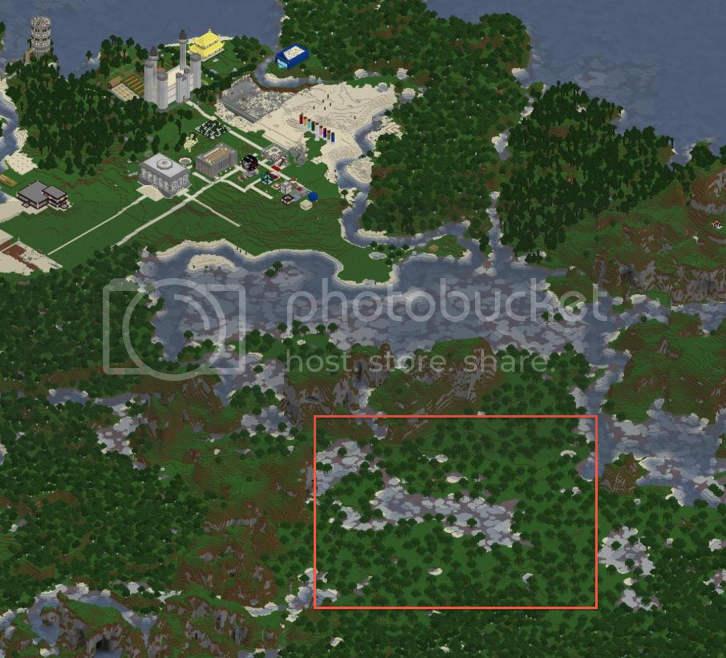 I haven't seen anyone claim it, so is it cool if I build something small in the space next to the BP School for the Gifted? Where it sort of slopes down into that desert? I made it flat up to the intersection, and I made a tentative outline where I wanted to build, but if someone had already claimed that spot lemme know and I'll tear it all down super quick. Land grab! Seems no one else has taken up camp in the swamplands southeast of the most recent spawn near Three Peaks. gerlocian's last known position was under an adjacent mountain, but I don't expect he'll mind having an aboveground neighbor since he'll probably be mostly underground. Land grab seems fine, Brad. I'd like to make one, too, but mine's pending the exploration of that portion to see how big the ocean is. Next time Turtle runs the map you should see a fair bit of that ocean. It's pretty big - I sailed out a good way (about twice the view distance on "far") before hitting a long skinny island. Not sure what's beyond that - I caught a glimpse of some swampland - but the ocean is a good size. Okay, I'm gonna lay claim to it in that case. Especially if there is eventual swamp. That would be perfect for what I have in mind. I have a small item built due west of my current position, but if it's in the way, it's not that big and easily moved. I've set up shop in the plains area in what used to be SW of the map. I'll post a screenshot soon to better illustrate. Does anyone have any objections to me setting up shop over here? Bumping this for a new claim and because the thread seems to have been forgotten about. I'm calling the mushroom island in the NE and turning into the Mooshroom Natural Preserve. At most I may build a nether-rail to it and turn one of the natural caves into a Visitor Center, but that's it. Please, no structures, no torches and no mining. If you must get your kicks by killing innocent Mooshrooms then travel to one of the other mushroom islands. "Leave only footprints, take only memories" or whatever that hippie saying is. Though, I'm far from a hippie, so the rule here is that if you kill a Mooshroom I will kill you and feed them your loot. So I was wondering if anybody had claimed this peninsula thing south of the Post Office. 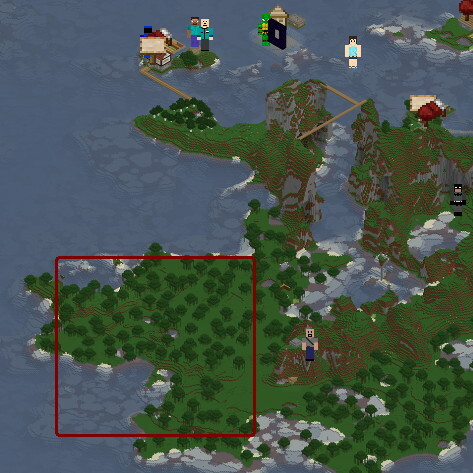 It looks like someone has already started terraforming it, I guess it was Ely? I just wanted to know if it is already claimed. I think Ely may have already had plans for that spot, Robo. There's plenty of space in the desert portion just west of me, if you'd like, and I'd be happy to help terraform it. I started terraforming it, but I'm not going to build on it. It's yours, Robo, I'll stop working there. I've got plenty of land to work on between my western outpost and the future rink complex even further out west. I really like that spot. It's, like, three fourths of an island! Good bump, 709. I may drag in some posts from the other thread(s) to here. Yes, I can rotate structures around the Y axis in 90-degree increments. Rotation and translation sometimes causes torches and paintings to pop off, and sometimes it can cause stairs blocks to face the wrong direction. Otherwise, it's fine as long as we don't mind waiting for the world to CHURN CHURN CHURN while it processes. I'd like a small plot in-town at TerraNova, but I want more than one plot. I want to divvy up some plots along an area that would have small properties, in rows or wards, to encourage dense, in-town properties. Small apartments, with architectural quality. A "tony" part of the town. Talking to grey about details now. Well that happened pretty fast!! Grey and I are selling SIX (actually five now, I bought one) in-town homes around the historic TerraNova Quad. Each lot is EIGHT (get it?) blocks square and the HOA states that you cannot (for the time being) build a basement. The use of modern architecture is encouraged, but not a requirement. Please deposit 800,000 glowstone in the community storage if you'd like to purchase one. Note: existing roadways are meant to continue on and around this development. No Digging In Those Plots!!!!! I will build one of the city houses, if that's okay. My peninsula home is a bit farther away than I thought, and I would like a little pied-á-terre in the city. Also, your screen shots are really big. So you may have noticed there is a rink location to the west. Pick the night layer on the map and you can see. Significant terraforming needs to take place first, but please no building in the western snow biome without checking first. Bruce I'm out at a waffle house after doing trader Vic's tonight. I've made part of the HOA that you cant have a basement!!! edit: Or not! Looks like 709 already claimed that area. I've got a claim I would like to make. Likely not going to need the entirety of this area, but this swamp would be appreciated. Errrrr. Duke it out you two.